Gerri can't decide what's more devastating: learning her rock-solid marriage has big cracks, or the anger she feels as she tries to repair them. Always the anchor for friends and her three angst-ridden teenagers, it's time to look carefully at herself. The journey is more than revealing—it's transforming. Andy doesn't have a great track record with men, and she's come to believe that a lasting love is out of reach. When she finds herself attracted to her down-to-earth contractor—a man without any of the qualities that usually appeal to her—she questions everything she thought she wanted in life. Sonja's lifelong pursuit of balance is shattered when her husband declares he's through with her New Age nonsense and walks out. There's no herbal tonic or cleansing ritual that can restore her serenity—or her sanity. Miraculously, it's BJ, the reserved newcomer to Mill Valley, who steps into their circle and changes everything. The woman with dark secrets opens up to her neighbors, and together they get each other back on track, stronger as individuals and unfaltering as friends. 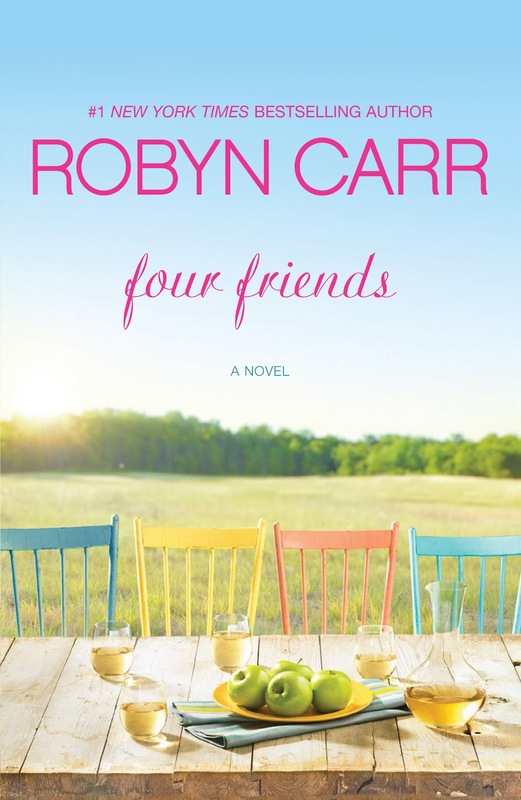 In Four Friends Robyn Carr has explored many of the issues that women - and men - face after the wedding. I am forever a romantic - and love the happy ending, however I recognise that just doesn't just "happen". The challenges of life, mistakes, reality, children factor in; our past may catch up with us, and what we have denied may now demand to be recognised. If we are fortunate we have good friends who walk with us, we courageously choose what will help us, and we grow. Love deepens or love dies. Four Friends explores big issues: abuse, infidelity, loss, depression, the menopause, mental breakdown, the challenge of raising teenagers, sexual orientation and the challenge of busy lives. Also the need for and often lack of good communication between husband and wife, which can lead to needs unmet. This book would be excellent for book groups, I am sure it would engender lively discussion. While its intended audience perhaps is women, I would love to think that men might read it too. I loved the four women and the way they supported each other, the way they were there for each other, at times one then another leading the way. Each had their strengths and weaknesses. Gerri is very organised and gutsy. She has a job she loves and is good at, three children and a husband. She also has time for friendships - and as well has a very healthy relationship with her mother-in-law. If there was one thing I didn't like about Gerri in the beginning is that she was just a tad smug! However life can knock those edges off us, and Gerri is no exception - she works through her challenges and comes out on the other side with renewed energy. Andy is a school Principal who has tended to choose the wrong man for her life, however I like that she has the courage to throw the scumbags out of her life. They deserve it. She finds a man in a million in a guise she didn't expect, her values just change up a little and suddenly new life opens up for her. Sonja - well I could understand how she was tolerated in the beginning by her friends but not really valued. She would have irritated me! However her story is powerful and I really liked how she had the courage to face herself, and her pain. I loved the way she comes out the other side, true to herself. BJ is the dark horse of the group and the one we see the least. We don't see so much from her point of view. Yet she has a profound effect on the other three and they all bond so strongly. BJ's life has already changed before the story opens, her new path just beginning. I really appreciated the way Robyn Carr portrays the men in this book, sure some were unredeemable and were readily dispatched as deserved. However Phil, George and Bob were men that I liked. Phil's story was written well, my heart went out to him, and while Gerri gave him some serious boundaries, I liked that a couple of times he quietly drew his line in the sand. George was a bit of a surprise, more caring than at first it seemed. Bob was the man of wisdom - I have copious notes of all the wisdom that he shared especially with Noel - Andy's son. This is a book for my keeper's shelf, my paperback copy is on its way to me as I write. Great review. This sounds like a wonderful book. Thanks Pat. Yes it is one to keep and reread.